Parking garages, bridges, concrete walls and masonry buildings can be waterproofed and sealed. This process can not only protect a structure but can stop stains (mildew, efflorescence, etc.) and can help reduce existing mildew and stains from structures. Small cracks (up to 1/16 inch) are automatically sealed in the initial process, with larger cracks or seams able to be sealed with additional products and extra effort. With over twenty years in the business, FoamCoat now offers a product line of "breakthrough" products for waterproofing/sealing concrete and masonry, both above and below grade, that have the following unique characteristics. "Green". These water-based products contain no oils or toxins and emit no VOCs. They have quickly become the product of choice for many DOTs for bridge treatment because, while provide outstanding protection for bridge decks, and sealing hairline cracks in both decks and columns, they are not harmful to the water supply, fish or animals. Permanent. Most waterproofing or sealing products begin to decrease in their effectiveness in a relatively short time-frame. The unique chemical structure of these products is such that they will actually be more effective years from the date of application than at the time they are applied. Concrete or stone will actually become more resistant to damage and deterioration because the crystalline nature of the product will continue to grow into the concrete improving and further penetrating and sealing. Guaranteed. Applied correctly, the products carry a five-year freeze/thaw warranty. Testing has demonstrated no significant change in performance at 300 freeze/thaw cycles. This is a major variance from other products which report testing at between 50 to 100 cycles. In West Virginia one winter period could use up most of a 50 cycle product. Easily applied. The surface does not require extensive preparation such as wet-curing, or abrasive blasting to remove many prior stains. 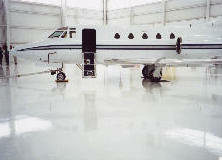 The products can be sprayed, brushed or rolled on. An in-house maintenance group can effectively use the products for sidewalks, driveways, parking lots, decks or concrete or masonry structures. Non-Coloring. The products will not change the color of the surface to which they are applied. Particularly important with colored masonry, once applied the stone/brick is sealed and protected from future erosion and discoloring. Where the stone/brick or concrete is already stained with mold or mildew the waterproofing/sealer will actually work to reduce existing stains, helping the surface to return, as closely as possible, to its original color. "Cure and seal" capabilities. Product is available specifically tailored to fresh or cured concrete. Application of the product over a concrete floor will eliminate "moisture drive" through the concrete, protecting carpet or wood from potential water damage. NOTE: Because of the uniqueness of these products and their doing so many things not typically provided by waterproofing/sealer products we recognize it may sound, "too good to be true". We welcome the opportunity to work with you to sample/test the products for your application. Call Dave Lang at 304-588-2739 to arrange for sampling/testing. Flooring: Epoxy floor sealers (trowel or rolled) for hospitals, laboratories, parking decks, floor processing plants, or any area where a sanitary environment is necessary. Leaves a surface that is durable and easy to clean. Waterproofing: Protect all your above and below grade concrete, brick, stucco, and masonry surfaces from deterioration due to water, mildew, fungi, dirt, freezing, and thawing with an application of a clear sealer that doesn’t change the appearance of the surface. Complete commercial and industrial painting services for commercial buildings, churches, refineries, manufacturing, chemical and power plants. We specialize in urethanes, elastomeric, apoxies, and fire retardent coatings..... if it can be brushed, rolled, or sprayed, Foam Coat will apply it. Sandblasting removes rust, dirt, corrosion and flaking paint to prepare steel and masonry for coatings; also etches the surface, filling it the proper profile for better adhesion. FoamCoat also sandblasts concrete to expose the aggregate for a very pleasing visual effect. Waterblasting: Sandblasting might not be necessary for some projects. Most dirt and grime can be removed with high pressure water to provide a clean surface for coating.